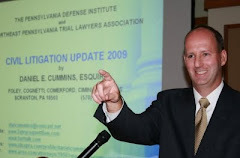 I am pleased to report that I have been named as Co-Chairperson of the Auto Law Committee as well as Co-Chairperson of the Transportation/Trucking Law Committee in the Pennsylvania Defense Institute. It is hoped that the members of these Committees will assist the PDI in generating informative articles for the PDI publication Counterpoint, writing periodic blog posts for the PDI Blog Counterpoint Plus on the PDI website (http://www.padefense.org/), as well as serving as speakers for any upcoming PDI sponsored CLE seminars. The Committees also hope to generate increased opportunities for members of the groups to network with other members in the field of Auto Law and Transportation/Trucking Law at the Annual Meeting of the Pennsylvania Defense Institute and other meetings.